Edna May Holman, my husband's grandmother, had her 103rd birthday on Saturday, January 4th and we had her funeral on the following Saturday. We never got to have her birthday party because she got pneumonia and didn't recover. One of my grandmother's died before I was born and I only met the other one once. Edna was really my only true grandmother and what a great grandmother she was. She had been ready to go home to heaven for quite some time and it was truly a blessing to know that she can once again hear the birds singing and garden to her hearts content in the most beautiful garden of all. This photo was taken when she was in the midst of having the old siding removed. I believe she was 100 in this photo, but it looks older because of the sepia tint. See that little rascal in the distance on the right? That's Lady and she now resides with us. Grandma out lived several dogs that she adopted over the years. This is what the house looked like once the siding was removed. With the siding removed, the outline of the old kitchen fireplace was revealed. I'm sure she probably cooked meals in that fireplace. This woman has cooked on everything from wood burning stoves to microwaves. She's seen a lot of changes over the years. She and her sister road a horse to school and had a remarkable story to share about that. The stories she would tell are forever in my memory and I've started saving them on my computer. This is the house with the siding almost completed. 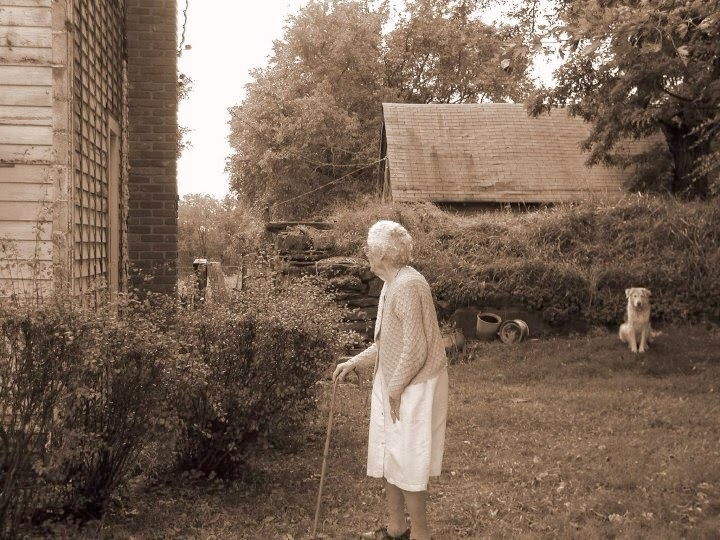 At 99 years old she asked the man who sold her the siding, "How many years is the warranty?" She was a very optimistic lady! Edna did live here by herself until she had her 101st birthday and then went into a nursing home. I will share more of her stories because she had such a great influence in my life and in my artwork. Thanks Diane and thanks for letting me know that my comments are once again working! What a lovely photo and such wonderful memories.